The SECI model is a common model in KM. This blog post from the archives suggests a way to expand this model. One of the basic models of Knowledge Management - often discussed, frequently challenged - is Nonaka and Takeuchi's SECI model. 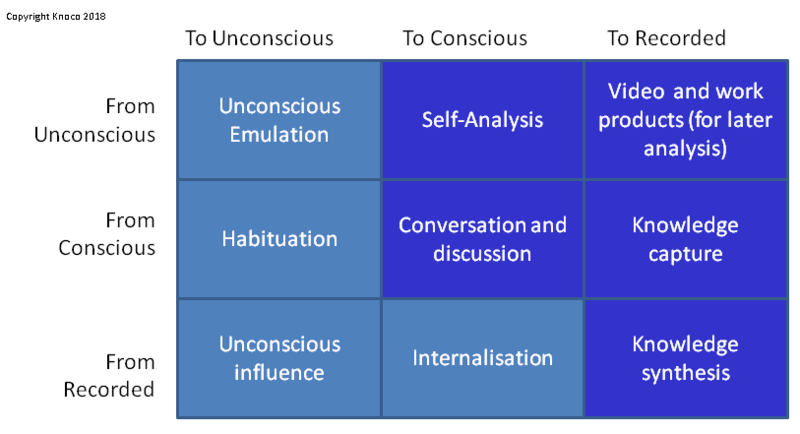 This is a 2x2 matrix, looking at the transitions between tacit and explicit knowledge (and the challenges to the model is often whether tactic knowledge can ever be made explicit, or whether it needs to be, or whether explicit knowledge is the same as documented knowledge). I would like to extend this model, because when we start to work with Knowledge Management in organisations, we find that knowledge actually lies in three natural states rather than two, and that we therefore need a 3x3 matrix rather than a 2x2. 1. Unconscious "Knowledge in the head" - the things you don't know you know. 2. Conscious "Knowledge in the head" - the things you know you know (of course the boundary between states 1 and 2 is gradual, and more of a transition than a boundary). 3. Recorded Knowledge (captured in documents, audio, video etc). The most powerful knowledge - the deep knowledge that experts possess - is in state 1. However if knowledge is to be transferred easily between people, it may need to change it's state in order to allow transfer. The 3x3 matrix above represents the 9 possible transitions. The dark blue squares are where Knowledge Management traditionally focuses (you can see that traditionally we only cover about half of the diagram). It should be stressed that every one of these transitions involves loss of value and loss of knowledge. We know (unconscious) more than we can say (conscious), and we often say (conscious) more than gets captured. Here are the 9 transitions or transfers. The transition from one person's unconscious knowledge to another's can be called "Emulation". This is how a baby learns, or how a craftsman can pass deep knowledge to their apprentice - by working together over years, often wordlessly. This is effective but very slow. To make unconscious knowledge conscious requires some form of analysis - usually self-analysis, as the knower has to be deeply involved in the process. Group self-analysis, or sense-making, is a powerful technique, and a good interviewer, facilitator, coach or psychotherapist can also help make knowledge conscious. Coaching and mentoring is a useful tool in this box, as are team reflection exercises such as After Action review or Action Learning. To record unconscious knowledge is difficult. About all you can do is record what the knower does - through videoing them at work for example - for later analysis. But to be honest, it's not yet knowledge, as all these recorded work products have to pass back through an analysis step in order to draw out the conscious knowledge. Maybe you can call the things in this box "latent knowledge". The transition from conscious to unconscious knowledge is habituation. At one time you were conscious of your golf swing, your fishing cast or your ability to drive a manual car, but over time it becomes unconscious. The transition between one person's conscious knowledge to another's often comes through conversation and discussion (particularly dialogue), and through techniques such as demonstration and teaching. Here is where discussion processes and structures such as Communities of Practice and Peer Assist become useful. The transition from conscious knowledge to recorded knowledge comes through interviewing, writing, documenting, capturing lessons - all the standard tools of knowledge capture. The transition from written knowledge to unconscious knowledge is a tricky one, but we know it happens. If you are brought up on a diet of Fox News, you end up "knowing things" that are different from those you would "know" if you were brought up on a diet of the Washington Post. I don't have the correct term for this box, but "Indoctrination" may be a good term. The transition from written knowledge to conscious knowledge is also difficult - here we can use the term "Internalisation" for that whole chain of "Read, Mark, Learn and Inwardly Digest"
The transition between various forms of recorded knowledge we can refer to as Synthesis - the bringing together, combination and "making sense" of disparate recorded sources into Knowledge Assets. Depending on the sort of knowledge you are dealing with - the deep unconscious knowledge of the experts, or the shallow knowledge of company procedures - you may need to deal with more or fewer of these 9 transitions.